What’s in a name? That which we call a kitchen showroom by any other name would smell as sweet. Right? Well, actually, technically, if you’re going to get really picky, they probably would SMELL as sweet, but in all likelihood, their name would not be as appropriate. Alright, you’ve come this far and done enough to embarrass Shakespeare, Linda, what’s the story? Well, the real story is that Personal touch kitchens, really does offer service with a personal touch – skilled design consulting, an excellent eye for color and an ear for what will work in your home and with your budget. 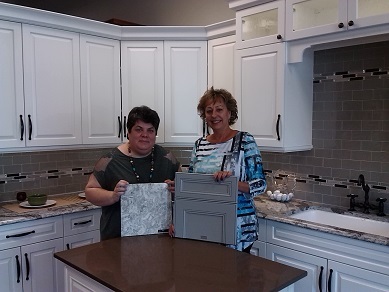 Owner Cheryl Colvin and her associate Kim Mcmann, pride themselves on delivering a beautiful product that works for their clients and it’s nice to know that they will be as enthused about your completed kitchen or bath as you will – well, maybe 95% as enthused, as they really won’t get to use it, but you get the idea. From a job that took her to hundreds of showrooms a year selling high end German plumbing products, Colvin realized (when the real estate market collapsed and it was passé to pay $1500 for a faucet) that she had enough collected knowledge to begin a new career in the kitchen cabinet business, which had always been a fav of hers. The only problem was that she had no income and there wasn’t a whole lot of high end renovating going on from 2007-2010. Let’s face it, it’s hard to think about maple or cherry cabinets? when the value of homes was dropping faster than the 1928 stock market crash. So, what was a girl to do? Get clever and fill a need. Which is exactly what she did. At the urging of her husband she started selling lower priced cabinets at the flea market, (she will most likely cringe when she reads this) but because of her care and attention to detail she soon established favorable word of mouth and soon realized that if she was to expand, she would need a showroom with 7 day a week access, air conditioning and no cow manure on the floors. A few years after acquiring her real showroom, Ms. Colvin was able to hire Ms. Mcmann, who already had years of experience in the business. Now they offer not only quality American-made cabinets but also counters, fixtures and custom sinks, and a wealth of helpful suggestions. Check them out – you will love what you find and you’ll see that there really is something in a name.